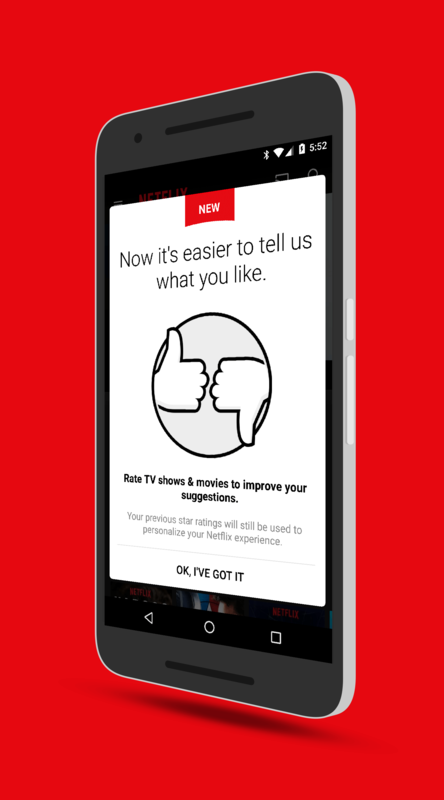 In the latest update to the Netflix app for Android, there is a new and simpler rating system for content. Gone are the up to 5 star ratings that users could give a television show, movie or Netflix original content. Instead, it has been replaced with a thumbs up or thumbs down rating. That’s it. No middle ground. It has become a binary “Did you like it or not?” rating. As you can guess, I’m not a fan. I understand what the streaming content provider wants to do. They want to make it less complicated for you to potentially try a TV show or movie. Think about it: How many 3-star shows have you skipped over only to go back and watch it because it was recommended to you by a friend? I know I’ve done it probably dozens of times over the years as a Netflix customer. Which is exactly why they are getting rid of it. thumbs up, I will have to watch a bit of it to figure out if I really like it or not. Making it even more challenging is that you can’t write a review up either. Like I said, it’s binary. Is it enough to make me cancel my Netflix subscription? No but I think these types of rating systems do more harm than help for consumers.